"The flooring store said to leave one quarter inch gaps for expansion at the walls...now the boards are lifting off the floor." Ill informed advice like this often leads to floor problems. Many flooring sales people unfamiliar with hardwood flooring assume expansion is the same as laminate flooring. In reality that 1/4" recommendation can sometimes cause problems for laminate also. What Is An Expansion Gap? Why Do We Need It? Expansion gaps are spaces left around the perimeter of rooms, against fixed objects such as columns, thresholds, hearths, baseboard, and other stationary items built or secured into the framing structure of the home. Even though wood flooring used is no longer living and breathing, it still reacts to moisture changes in the environment. The cells in the hardwood will take on or absorb moisture when the relative humidity is high, or when exposed to water. Expansion takes place, and the hardwood grows, for lack of a clearer term, across the grain or width of the plank (see below, not all will react this way). Conversely, when air moisture levels decrease, moisture content evaporates, shrinkage occurs. When I say spaces, they are defined as installing the flooring up to and away from the fixed objects. For example; "I left 3/4" expansion at the baseboard." Solid hardwoods by far, will expand and contract more than engineered products. How much will depend on the layout involved, seasonal change in relative humidity, species selection, and type of hardwood cut. For smaller areas such as 10' x 12' rooms, leaving 3/8" expansion would be satisfactory. However, getting into larger layouts over a few thousand square feet it would be wise to stay within the age old guideline of at least 3/4" on the perimeter. Solid wood floors will expand more in the direction of the tongue and across the face of the product. In large layouts it is suggested to start the installation near the center to offset the expansion properties. The use of slip tongues or splines would be used to reverse the direction; having the flooring installed with the tongue facing out both ways from the center. The example shows the use of the slip tongue highlighted in black. Slip tongues fit into the grooves of the plank by way of gluing with a yellow carpenters type or Titebond. They are generally shipped in four or six foot lengths but many experienced installers have been able to get by, making them from material on the job run through a table saw. Splines also come into play when reversing the direction of the installation. In some cases most of the installation is going forward (tongue facing out) through the house. Other areas may fall behind, requiring a direction change with the tongue facing out. Floors should not be fastened into the groove. 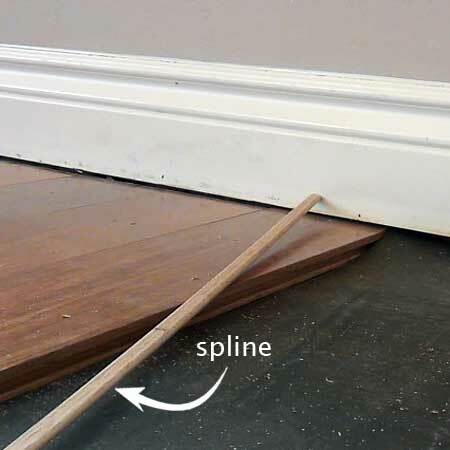 Another area where splines are often used would be starting or running an installation off stair nosing. All stair nosing is grooved. Glue down floors do not fall into this category as most are of the engineered variety. Slip tongues can be used but are not mandatory. Most installations begin with the groove facing out, (lock and fold exlcuded) enabling a cleaner way of installing; glue is not scooped into the groove. Engineered floors do not require the expansion area solid products need due to the way they are constructed in cross ply layers similar to plywood. Expansion and contraction is minimal to none as the ply layers act to restrict the movement in the overall product itself. The exception to the rule is a floating floor. Floating floors once installed basically become one large sheet of flooring. The entire unit will expand and contract as a whole. Granted, it does sound confusing. Let me clarify this. When three inch wide engineered floors are installed for example, by way of naling they become one unit alone. The next piece installed adjacent becomes another. They have their own built in but barely noticeable expansion if you look at it close enough in the manner each piece is manufactured. On the other hand, most of the older floating floor products are milled with such precision there is no expansion. They become connected. 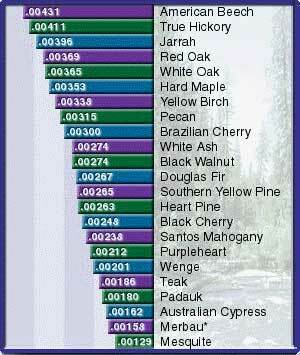 Another wrench thrown into the equation lies in how much each type of hardwood species will expand and contract without any reference to the moisture level changes. Much can depend on the way it is cut from the tree. Most solid woods sold today are considered flat or plain sawn, where the expansion takes place across the grain when installed. Our illustration to the right shows more common cuts used for solid flooring. 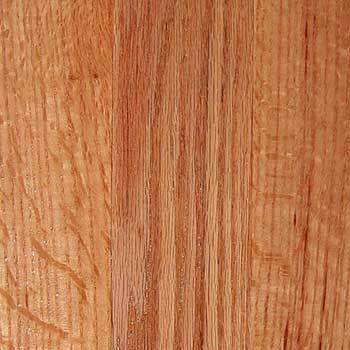 In older homes it is not uncommon to see quarter sawn or rift sawn flooring. These products are still available but the cost increase. Quarter sawn hardwoods expand vertically because of the method in which they are milled from the log. Rift sawn is a form of plain and quartered as the sawing takes place at a 30 degree angle to the growth rings. Comparing the differences with expansion and contraction, quartered will be the most stable (nill movement horizontally), rift will take on both horizontal and vertical expansion properties, while plain sawn will be the most susceptible to movement across the grain once installed. 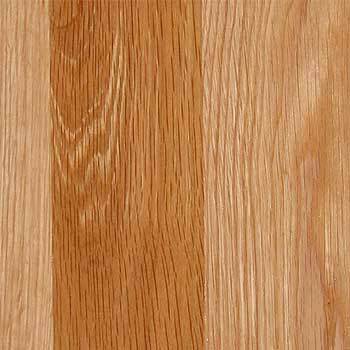 Other types of hardwoods that have limited expansion and contraction properties are sources taken from the heartwood portion of the tree. Annual growth rings are tighter. What happens in this situation is the tighter the grain the less susceptible to movement the floor becomes. Okay, this one gets harder to explain. The Phd wood experts call it the dimensional change coefficient. Yea, that kind of stuff was not on my list of favorite subjects in high school either. What they're trying to say is each species will react different when moisture is present or not present. In the chart shown to the right the higher the number the more susceptible each species will be in relation to movement. 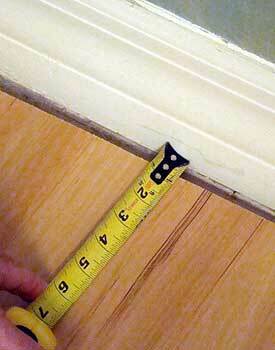 These figures should be used when relating to flat or plain sawn flooring. Keep in mind, many factors can affect the expansion and contraction of wood floors. Maintaining a stable level of relative humidity in your residence (including basements and crawl spaces) will minimize movement with solid hardwoods. Installing floors in warmer more humid conditions combined with dry winter heating months can prove troublesome, unless some precautions are taken.